Norris is demonstrating something called HyperSonic Sound (HSS). The aluminum plate is connected to a CD player and an odd amplifier -- actually, a very odd and very new amplifier -- that directs sound much as a laser beam directs light. Over the past few years, mainly in secret, he has shown the device to more than 300 major companies, and it has slackened a lot of jaws. In December, the editors of Popular Science magazine bestowed upon HSS its grand prize for new inventions of 2002, choosing it over the ferociously hyped Segway scooter. It is no exaggeration to say that HSS represents the first revolution in acoustics since the loudspeaker was invented 78 years ago -- and perhaps only the second since pilgrims used ''whispering tubes'' to convey their dour messages. In the years Norris has demonstrated HSS, he says, that's been the universal reaction: the sound is inside my head. So that's the way he has started to describe it. Just to check the distances, I pace out a hundred yards and see if the thing is really working. (I've tried this other times -- in a posh hotel in Manhattan, in another parking lot in San Diego -- but HSS is so often suspected of being a parlor trick that it always seems to bear checking.) Norris pelts me with the Handel and, to illustrate the directionality of the beam, subtly turns the plate side to side. And the sound is inside my head, roving between my ears in accord with each of Norris's turns. No observer would expect a technological revolution -- any revolution -- from Elwood G. Norris. At 64, he has the demeanor of nothing so much as a high-school football coach. He lacks every single cliche of how inventors are supposed to act and look: the eccentricities of hairstyle, attire and vocabulary. He dresses as if he lives a life of Saturdays, perpetually in khakis and polo shirts. He is utterly normal -- even peculiarly normal. Norris wasn't the first to think of focusing sound waves. Far from it. Since the advent of the cone-shaped megaphone, every major acoustics company has traveled similar terrain. ''If I'd known how many people had tried to invent this thing, and how smart those people were, I never would have touched it,'' he says. ''Once we designed our own emitter -- which was not an obvious choice -- we patented every nut and bolt.'' Today, A.T.C. has 14 patents in the U.S. and hundreds pending worldwide. The company has spent millions on patents alone. Even Florida Power and Light has been given a taste. It seems endangered canaries have been sparking themselves to death on power lines and could do with some warning. In past months, Norris and his staff have made a further, key improvement to HSS -- instead of sending out a column of sound, they can now project a single sphere of it, self-contained, like a bubble. Not surprisingly, people who've heard of HSS have responded variously. On any given day, Norris might receive 17 e-mail messages from a company in Hong Kong begging to manufacture HSS -- and several from civilians who think he's either a genius or a psychopath. One man recently wrote to insist that Norris ''be jailed'' if he fields this product (curiously, sending this demand to Norris). And a woman wants to secretly install HSS in her lover's car or golf bag so that she may continually transmit a message deep into his head: Marry Donna. . . . Marry Donna. There were a score of other inventions. Some panned out; some didn't. American Technology Corporation came into being in 1980 to nurture a long-play tape recorder, one that could fit 20 hours of sound on a regular cassette. Of course, CD technology put an end to all that. Shame, too, Norris says. They'd worked with drama students and everything -- had the whole New Testament recorded on one tape. Despite his claim that he is ''a fundamentally lazy man,'' Norris was always tinkering. There was his innovation of the digital recorder in 1994 (another Popular Science ''Best of'' pick); the world's tiniest FM radio, weighing less than one-quarter of an ounce; a tracking device for wayward toddlers. These days, Norris's new love is the AirScooter, a personal helicopter that takes no more than an afternoon to master. It's slow, smooth and lacks the complexities of an actual copter. And, as it has been whittled down to meet the government's ''ultralight'' standard -- weighing less than 254 pounds -- you need not be licensed to fly it. Often, Norris says, inventions are the result of some left-field theory he blurts out before he has time to think it through. Scientists at NASA once got wind of an offhand remark he had made about wireless receivers and flew him to Texas; they'd been having trouble with boom microphones slipping around inside space helmets. ''Suddenly I hear these words coming out of my mouth,'' Norris recalls: '' 'Well, I can give you a one-piece system so you won't need a boom mike at all. The sound can come through the bones in your head!' And the NASA guys were, like, 'Yeah. Right.' '' Thirty days later, Norris had a prototype, which the space agency grabbed with both hands. Norris translated the concept into an ''all-in-your-ear headset'' that came to be called Jabra. ''I did that technology in a weekend on my Mac at home!'' he says, roaring like a con man. ''And it's still selling. Some New Yorkers bought it for a couple million bucks -- and eventually it sold for $75 million to, I don't know, some Dutch company.'' Norris is often hazy on whatever happened to his original concepts, as he abandons them once they near the manufacturing stage. He just loses interest. With some (the digital recorder, for example), he's not even exactly sure if he's still receiving royalties. Presumably, his money managers know. Of all Norris's inventions to date, though, it's HSS that could prove the most pervasive. The specter of a world shattered into billions of potential advertising spheres -- of inescapable, intrusive voices, as in a less-rainy version of ''Blade Runner'' -- has a way of concerning people. To Norris's way of thinking, however, a shop with 100 confined spheres of sound is preferable to one where 12 speakers are blaring over each other. Of course, you might argue that Norris needs to believe that. After all, A.T.C. has seven years and over $40 million in this project. But that isn't exactly so. Besides being wealthy to the point where he's sheepish about it, Norris has already moved on to other inventions, a few books and even a sci-fi screenplay in which, he says, both Fox and Sony have shown real interest. For the moment, though, HSS is unfinished business. As night must follow day, there are Defense Department applications. Norris and A.T.C. have been busy honing something called High Intensity Directed Acoustics (HIDA, in house jargon). It is directional sound -- an offshoot of HSS -- but one that never, ever transmits Handel or waterfall sounds. Although the technology thus far has been routinely referred to as a ''nonlethal weapon,'' the Pentagon now prefers to stress the friendlier-sounding ''hailing intruders'' function. If the U.S.S. Cole had been equipped with a HIDA system, the attack of October 2000 could never have succeeded. Most of the sounds under military consideration are classified, but some are approved for public consumption. One truly harrowing noise is that of a baby crying, played backward, and combined with another tone. As usual, Woody Norris is pleased to demonstrate. Woody Norris is pleased about everything. Norris prods his assistant to locate the baby noise on a laptop, then aims the device at me. At first, the noise is dreadful -- just primally wrong -- but not unbearable. I repeatedly tell Norris to crank it up (trying to approximate battle-strength volume, without the nausea), until the noise isn't so much a noise as an assault on my nervous system. I nearly fall down and, for some reason, my eyes hurt. When I bravely ask how high they'd turned the dial, Norris laughs uproariously. ''That was nothing!'' he bellows. ''That was about 1 percent of what an enemy would get. One percent!'' Two hours later, I can still feel the ache in the back of my head. Even his identity seemed constantly in flux. Until he was 17, his surname was Harden. For reasons he remains hazy about, his mother deemed it necessary to haul the boy down to the courthouse and legally change his name at that rather advanced age. Discussing it, Norris's jaunty tone never falters, but a deadness in his eyes transmits -- quite directionally -- the blunt truth that these were dark times for him, rooms of his memory he doesn't care to revisit. His new life is brighter and built to his liking. Through all those desperate attempts at normality, Norris remained a staunch Mormon. After serving in the Air Force, he spent 16 years living in Salt Lake City and achieved the level of high priest. He wore the ''sacred undergarments,'' married his first wife in the Temple, the works. But by the early 90's, having previously written a book on Mormonism, he had lost his faith and now has a 1,000-page manuscript stashed away that, he says, takes strong issue with the Book of Mormon. Still, debunking Joseph Smith will have to wait. There are screenplays to polish. There are impossible machines to conceive, then abandon. hile Norris's work quarters are cramped and modest, his house is quite the other thing. To thrust some dime-store psychology upon him, Elwood Norris has sought to expunge the deprivations of his youth with garishly expressed prosperity. The Norris estate is Mediterranean style, on what seems the highest hill near San Diego, surrounded by what appear to be a few counties of rolling coastal sage. Outside the place, overlooking its 44 acres, there's a vanishing-edge pool, a guest house, garage space for the family's three Lexus cars (with a slot to spare). Freshly antiqued Roman columns and statues of stallions blot out shards of the mountain view. Sculptured cherubs' faces, affixed to the house here and there, turn out to be modeled after Norris's youngest daughter, Tiffany, whereabouts unknown -- though, since the edifice is 20,000 square feet, no one would be the wiser if she were throwing a huge party in there somewhere. Not a surface of the mansion's interior is deprived of gilt or silk or velvet; you'd swear it. There is a mind-bendingly well-stocked screening room, a pistol range, miniature models of towns assembled in rooms that seem designed specifically to showcase miniature models of towns. Only the wine cellar is underwhelming. Norris, the lapsed Mormon who hadn't a sip of alcohol or caffeine until the age of 50, is new to the stuff. Seven bottles of Something French are huddled together under a table at the back of the room, as if hiding in hostile territory. I ask the inescapable question: if anyone can buy and fly one of these helicopters, isn't there the possibility of, well, grim and horrible chaos? The AirScooter's inception was typical of Norris's restless habit of simply walking away once an invention seems to have taken final shape. At A.T.C., once HyperSonic Sound was near completion, he started musing about the science of aviation. That was a frontier he'd never crossed, despite the hang-gliding scar that is lost in his well-creased forehead. Though HSS and the minicopter are making headway -- the full-size AirScooter will be available to the public by year's end, with a starting price of about $50,000 -- Norris is deeply involved in two new projects. He refuses to discuss these in any detail. His lab, in a rackety building near his house, smells of stingingly powerful glue and is cluttered with disparate apparatus: a gas chromatograph, transistor oscilloscopes, a one-million-Gauss magnet strong enough to tear fabric and human flesh alike. I ask if there's anything here that will betray Secret Things he's working on, but Norris has already disinfected the place of clues. One project, he acknowledges, involves hydrogen and fuel cells. Of course, a man with secrets divulges first what he values least. It's Norris's way that, the more open he is with his first statement, the more he will clamp shut with his next. This is no exception. When I press him for a single word that would offer at least a vague idea of the Big Invention's category, he squints for a full minute and, seemingly in pain, whispers one out: matter. Then he searches my face for signs of recognition, half terrified that I'll guess what the technology is and half hoping I will. He is dying to say. It's his holy grail. o one will ever know what makes inventors capable of staring at that which does not yet exist. Perhaps some form of hardship, in one's early years, is a factor. Edison went practically deaf as a boy; Alexander Graham Bell lost both his brothers to tuberculosis and was so sickly that his family moved to Canada in the hope of bracing him up. Then again, Benjamin Franklin and the Wright Brothers sauntered through childhood without a scratch. Woody Norris, in his formative years, was by no means unhealthy, but poverty left indelible marks. Maybe, in his case, that was a catalyst. Maybe mechanical figments were the cure when reality wasn't enough. Marshall Sella is a contributing writer for the magazine. 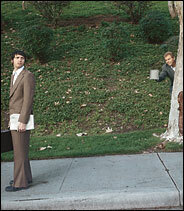 Woddy Norris, lurking behind tree, demonstrates how he can spring unexpected sound on an unsuspecting passerby. Forum: What inventions would you like to see? The fruits of Woody Norris's restless mind. At left, the world's tiniest FM radio. At right, Norris's new love, the AirScooter, in flight. The 2003 Rock and Roll Hall Of Fame sponsored archive contains New York Times articles from the past 20 years about the 2003 inductees, including reviews of vintage performances, profiles and interviews, as well as articles on the Rock and Roll Hall of Fame itself.